For high density applications. 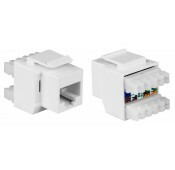 Connector is only 0.675" wide compared to the larger 0.825". Accepts 23 through 24 AWG wire. Compatible with PNL-PTCH-MKY6-48, fits 48 mini keystone jacks in 2RU.